The Cliffs of Moher are in line to become Ireland's most popular tourist attraction after impressive increases in visitor numbers for the first seven months of this year. The number of people visiting the north Clare hot spot has climbed by more than 15pc so far this year, prompting management to urge visitors to come at off-peak times to avoid the large crowds. 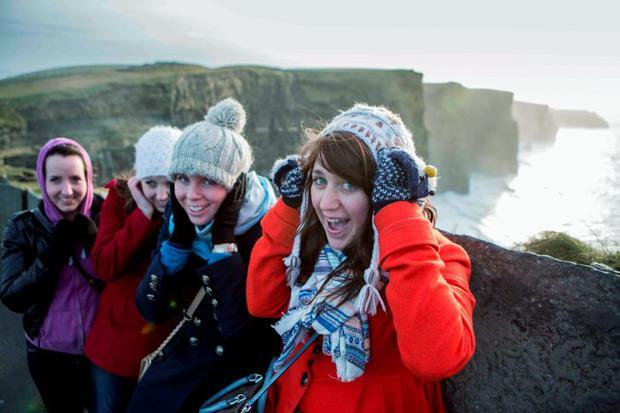 Last year, more than one million visitors saw the spectacular cliffs for the first time ever, making the attraction overtake Dublin Zoo as Ireland's second favourite tourism location. Should the latest increase continue through the second half of the year, the Cliffs of Moher would grow its overall tourism numbers by a massive 162,000 - up to 1.24 million visitors. That will put it within touching distance of the Guinness Storehouse in Dublin, which topped the list of Irish tourism attractions last year with 1,269,000 visitors - the highest yearly visitor total ever recorded for any Irish tourist attraction. "August is our busiest month and we look forward to welcoming large numbers of visitors," said Katherine Webster, of the Cliffs of Moher Visitors' Experience. An increase in bus and coach traffic has driven much of the growth in visitor numbers to the Cliffs of Moher in recent years but the centre has seen increases in all sections.